Rated 5 out of 5 stars by 11 PRO members. Stealth B2 full package 3.0 for FS9. Just unzip the ZIP FILE (steab2v3.zip) in Your FS2004 directory and load Northrop Grumman/Stealth B-2A from Your aircraft menu. That's all. The Stealth B2 Spirit is a heavy bomber aircraft that uses stealth technology to penetrate and weaken the enemy’s defenses. It is capable of deploying both nuclear and conventional warheads. It can seat two people and can carry up to sixteen nuclear bombs weighing 1600 pounds. The archive steab2v3.zip has 181 files and directories contained within it. No matter what kind of flying you are into, you will find that taking into the skies with a stealth bomber is one of the most enjoyable things that you can do! Whilst I’m more than used to FSX now, so much so that my FS2004 only gets a rare dusting down, I simply had to fire it up to give his a project a shot one more time; in my opinion, it’s one of the finest stealth bomber packages I’ve tried out when using FSX! This download is the full package and will give you total access to everything that you need – a huge amount of awesome features are provided with this, giving you all the freedom and help that you need to start really making a difference in the long-term to your flight simulation experiences. Nothing is more enjoyable than being able to take off into the skies in some proper high-tech military grade hardware, and it truly stands up when you first boom out of the airport in this absolute monster of an aircraft. Built to give you an authentic flying experience, everything stands out so much. The cockpit, for a start, is like a maze at first! You’ll have so much to work with and try out that you’ll probably spend more time than anything just using all of the various available buttons in the cockpit! The attention to detail within the cockpit is one of the most impressive I’ve seen in a flight package for FS2004, and really makes the aircraft stand up to the more modern additions in recent times. With a multi-function display, 18 switches on the monitor that are fully functional, and a variety of other useful features all in front of you it can feel like you have the keys to the world in your hands; this really pushes the boundaries of FS2004 to give you the most realistic flying experience that was possible back in the day. Whilst you might be used to the more modern FSX packages out there today, this is an absolute steal for anyone who is either still on FS2004 or, like me, enjoys a quick jaunt back in time! Now you don’t need to use FS2004 and settle for the massive difference in quality between both games; with a bit of looking around you can save yourself a lot of time and patience by adding this package. You’ll be able to fly around in one of the most convincing – and cool – aircraft ever built. When you look at other war games and war movies, they always are desperate to get the fabled stealth bomber in there; and why not? It’s a truly iconic design. 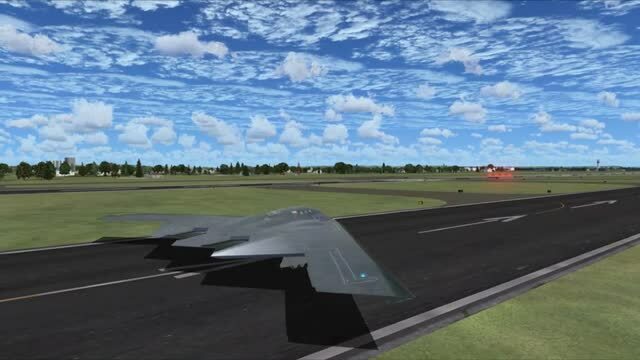 So why not join up yourself and start ripping through the skies at barely believable speeds in a proper stealth bomber? Giving you access to all the strength and all the tools that you could possibly need to give you something that is not only fun to fly, but truly educational! Easy install! All downloads should be as easy to install as this one. I'm not an expert. I had to use flaps to slow down! I imagine flaps would break off on real flight?! THX!!! What others? Let me know. I just love it! Easy to download, easy to fly, interesting, good panel. Where can I get more like this!!! sweet sweet sweet! best panel ive seen yet! I like it, there are some things that could be better but what the heck, it's fun to try out. very responsive without being too twitchy,nice to fly, even easy to ignore the ground proximity warning when it comes on at at 2900 feet!, mmmm nice!!!!! !